Neena Goswamy, a Hayward native, is the Lead Founder and proposed Executive Director of Hayward Collegiate. She is currently a Fellow with Building Excellent Schools, through which she is studying nearly 50 high-performing charter schools across the country to learn best practices. 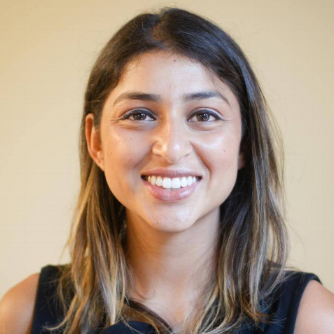 Ms. Goswamy joined Teach For America in 2011 and taught for five years, as a high-school reading teacher in the Noble Network and founding teacher for KIPP: Bloom on Chicago's South-side. Her scholars had the highest proficiency rates of any open-enrollment school in the city. Most recently, Ms. Goswamy worked as the Director of Growth at EDpuzzle, an ed-tech company pioneering online learning for teachers and students. She graduated with honors from the University of Washington with a Bachelor of Arts Degree in International Studies with a focus on economics. She is excited to come back to the community she is from to bring an incredible school option to the families of Hayward.